My finest storm season to date with a record number of daylight thunderstorms complimented by four night lightning events which is a new personal record of mine and a rare occurrence for N. Ireland. Highlights include the numerous chases, both local and far, the Ballyronan Marina amazing electrical display, the Mullaghmore high CAPE high-shear event which was the biggest set-up in the last decade, the Downhill Beach shelf cloud then the Maghera rope funnel cloud which is the first good funnel I have captured in years. These storms made for the perfect thundery break down after several hot weather episodes which made for the perfect Summer. Also included are moonlit snow shoots, rare snow devils, big waves & extremely rare Polar Stratospheric Clouds (PSCs) which I had witnessed for the first time in more than 20 years of observing. These events are accompanied by drone footage of storms and a spectacular 360 degree aerial rainbow. These memorable adventures can be viewed and re-lived through the 24 image reports below. 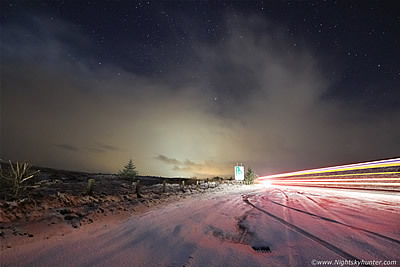 On January 24th 2016 I enjoyed my first photo shoot of the year on Glenshane Pass due to a short cold spell event which introduced Arctic air across N. Ireland generating several days of frosts, pristine air and periodic snow showers. I spent several hours on the mountain roads shooting night snow scenes with car trails using my window mounted DSLR in the company of passing snow showers, soft moonlight and beautiful starry skies which made for a fun night out under the heavens to get my first winter scenes of the new season. One page report with 7 images and 1 video clip. - REPORT. On January 31st 2016 a routine snow drive across the Sperrin Mountains took a dramatic turn when Roisin, my Dad and I encountered snow devils rotating across the mountain peak near the Glenedra road above Draperstown. We ended up watching at least a dozen snow devils of all sizes from compact highly concentrated whirlwinds to broad areas of circulation. 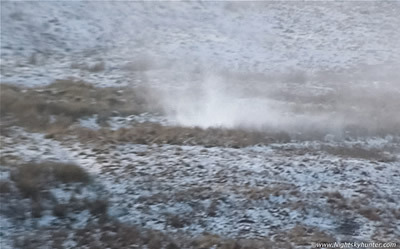 The highlight was when a large snow devil formed near the mountain summit, raced down slope, crossed the field in which I stood, impacted me, passed over the car causing Dad to duck then reform as a white vortex in the fields behind us which made for an unforgettable day of Winter action. If this wasn't exciting enough a lost video camera adventure ensued then Dad had his maiden flight of the Phantom 3 quadcopter over the snowy landscape during last light. One page report with 13 images and 1 video clip. - REPORT. A deep and explosive Atlantic depression christened 'Henry' was due to impact the N and NW coastline of N. Ireland during the afternoon hours of Feb 1st 2016. Severe weather warnings were issued for 80+ mph winds with ''sustained hurricane force winds'' across the ocean, ''50ft waves'' and ''phenomenal sea conditions''. These warnings could not be ignored so I went chasing to the Co. Antrim coast with my Dad and Wife where we spent the day in awe shooting the incredible waves battering the Portstewart coastline. 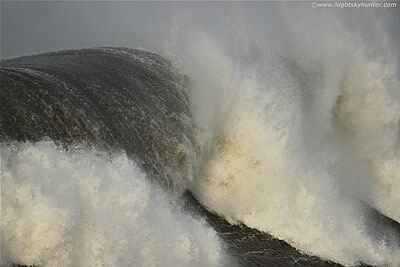 The ocean was a visual spectacle with massive breakers and trains of tsunami-like walls of water relentlessly thundering towards shore in what was for me the best Atlantic storm I have witnessed in years. One page report with 15 images and 2 video clips. - REPORT. 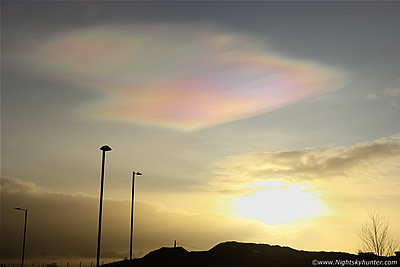 An extremely rare outbreak of Polar Stratospheric Clouds known as 'Mother of Pearl' or 'Nacreous' formed in the skies over UK and Ireland thanks to a combination of the southward displacement of the Polar Vortex and seeding from storms Gertrude and Frank which produced stratospheric temps of -80 degrees C. For the first time in 19 years of observing I had the privilege of photographing these rarest of clouds on Feb 2nd 2016 in the pre-dawn sky from Cookstown then after sunrise from Castledawson roundabout. These alien lenticular shaped iridescent clouds glowed vividly in the sky adjacent to the rising sun making for one of the rarest atmospheric phenomena I have ever seen. Also included is a beautiful sunrise from Glenshane Pass on Feb 3rd and my maiden flight of the Phantom 3 Advanced drone. One page report with 14 images and 2 video clips. - REPORT. During the previous two weeks I had been the proud owner of the Phantom 3 Advanced quadcopter and had been training on fair weather days to improve my flying and filming methods. One of my main reasons for wanting the P3 was because I have always wanted to film snow from the air. On Feb 17th that chance presented itself when a frontal system clashing with cold air produced an isolated high ground snowfall. 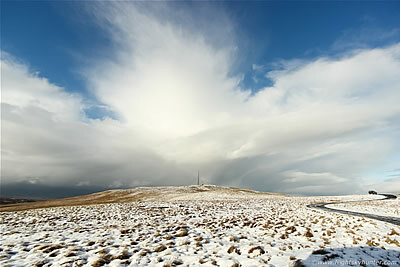 I spent that afternoon on the summit of Slieve Gallion which was covered in pristine snow with sunshine and blue skies aloft and made my dream come true. I filmed the snow from a great height then close to the surface during golden hour in perfect light getting the kind of aerial footage I have always wanted which was a thrilling experience. 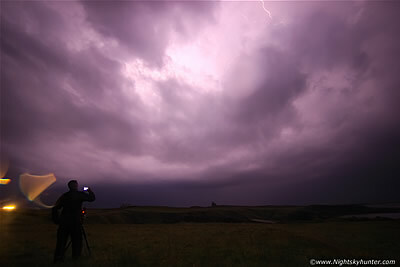 The report also includes DSLR still images from the 17th and 18th. One page report with 14 images and 1 video clip. - REPORT. 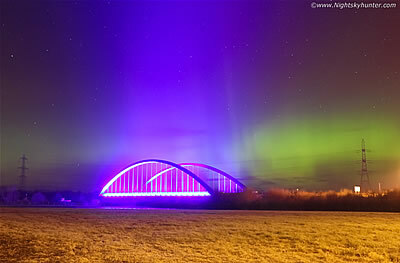 Mother's Day will be long remembered for the stunning aurora display which manifested in the frosty night sky after dark on March 6th 2016. NOAA had issued a G1 storm watched however thanks to a southerly Bz and CIR effects this aurora intensified into a beautiful G2 geomagnetic storm. My Wife and I, by chance, happened to catch it inland from Co. Antrim just as it was going into outburst and watched in awe as the sky turned green and red as a multitude of pillars danced across the sky beside the famous Toomebridge with rays penetrating straight through the lights and over the carriageway which made for a spectacular and unique visual scene to shoot. One page report with 7 images. - REPORT. On March 7th 2016 I went for a walk with my Wife and Dad through the woodland near Lissan House outside Cookstown with the intention of doing a routine test flight of the Phantom 3 quadcopter. Suddenly the clouds parted then a magnificent rainbow appeared on the departing shower generating a rich primary and secondary bow with supernumerary arcs. 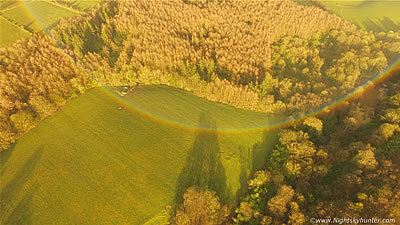 Despite precip falling from the sky I got the P3 airborne and managed to film an incredible rare 360 degree full circle rainbow with the coloured bow projected onto the fields and treetops below with Lissan House in the frame making this the first aerial rainbow all of us had ever seen. One page report with 15 images and 1 video clip. - REPORT. First storm chase of Spring on March 26th 2016 when Roisin and I chased to Mullaghmore in Co. Sligo to take advantage of afternoon unstable skies in a stormy SWly flow. We encountered sustained severe winds which rocked the van forcing us to stay inside for the duration of the shoot with rough seas, big swells and sheared wave tops. 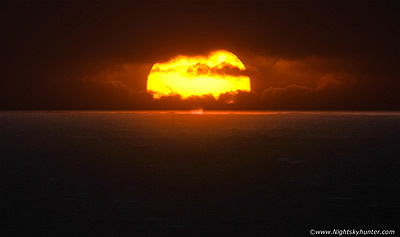 The highlights were the fast moving continuous barrage of convective showers accompanied by strong squalls and horizontal hail stones complimented with moody storm clouds and a stunning sunset over the ocean horizon. One page report with 8 images and 1 video clip. - REPORT. March 27th brought the first true inland convection of the season across Ireland with 400-500 CAPE in an unstable SWly flow with good lapse rates and no cap which promised a fine day of storm chasing with heavy showers of hail and isolated thunderstorms. My Wife Roisin and I went chasing together then met up with John Fagan at Ballyronan Marina where we spent the entire day shooting cells crossing Lough Neagh with particularly large cells being invigorated by their passage across the lough during golden hour which made for a satisfying day of convective photography with 8 hours on location taking stills, DSLR and video time lapse and even a quadcopter flight to film a cell from the air. One page report with 8 images and 1 video clip. - REPORT. Third storm chase of the 2016 season on March 29th on a day of unstable air with -35 degree C cloud tops and good visibility. 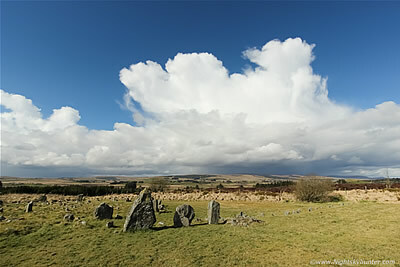 Based on model data we decided to chase to the southern Sperrins in Co. Tyrone at Beaghmore Stone Circles. Roisin and I were joined by Paul Martin, Tracy Sharkey and John Fagan and together the five of us spent the day storm spotting from this infamous megalithic site. We got treated to the passage of beautiful convection and cells in full sunlight and surrounded by clear air adjacent to the stone circles themselves where we shot still imagery and time lapse video which made for a very rewarding day. 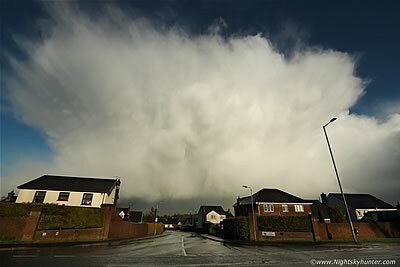 Also included are images of dramatic storm clouds at sunset from Glenshane Road the following day during another chase of March 30th. 1 page report 13 with images and 1 video clip. - REPORT. An unexpected surprise manifested after dark on April 7th 2016 when a heliospheric current sheet generated a G1 geomagnetic storm. 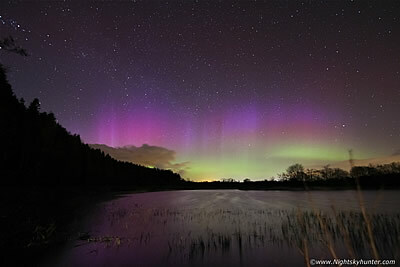 Long time aurora observing friend Conor McDonald and I watched the event from Killyleagh Lough outside Maghera under a beautiful clear and dark moonless sky. The aurora went into three outbursts with a vivid green arc displaying pillars which were so bright they blocked out the stars and reflected upon the lake. Half a dozen or more rays punctuated the sky as the rainbow-like arc pulsated in brightness with beautiful pink and purple colours on camera which made for a stunning night under the stars. One page report with 6 images, 1 time lapse video and 1 aerial video of the lake filmed using a drone. - REPORT. I went storm chasing on April 9th 2016 with my wife Roisin and photographer Paul Martin to hunt for funnels and thunderstorms in Co. Fermanagh where slack air and local convergence looked favourable during afternoon heating hours despite the low end instability. We encountered a short lived funnel cloud embedded within precip upon arrival over Lower Lough Erne then drove through the aftermath of a strong hail core in Belleek which left deposits of hail on the fields and roadsides like snow. During the evening hours we relocated to Pigeon Top mountain outside Omagh where we took drone footage of a large cell over Strabane to our N with anvil and sweeping hail curtains. 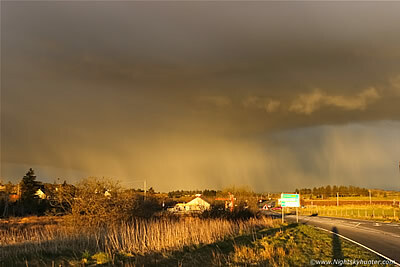 The day ended during the drive home when Roisin and I met a beautiful cell with dense hail curtain lit by sunset colours as it passed over the main Omagh Road near An Creagan. One page report with 8 images and 2 video clips. - REPORT. With the arrival of high pressure and an entire week of warm and dry weather ahead I decided to get airborne and spend the entire week flying and filming with the Phantom 3 Advanced quadcopter/drone spending long hours outside filming and training from a variety of interesting locations. 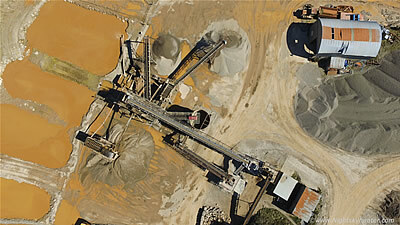 This report documents the filming and aerial exploration of five different quarries throughout this period which was a fascinating experience, the highlights were McCann's, Creagh and Northstone Materials quarries including the visual observation of several dust devils and the appearance of a beautiful and complex sun halo with intense upper tanget and parry arcs near Lough Fea. One page report with 17 images and 5 video clips. - REPORT. On May 2nd 2016 I was in Cookstown watching convection all day from my Dad's house while working on my lap top when radar showed a formation of heavy convective showers out west heading for the Co. Tyrone area. After 19.00 UT we could hit by heavy rain and blustery winds then just as the cell passed the house we got treated to a stunning primary and secondary rainbow and a huge solid anvil with mammatus passing over the estate all lit into brilliant high contrast white by the low sun and surrounded by blue sky. The cell looked beautiful and dramatic towering over the houses while I took DSLR images from the estate and road to document the scene, I also obtained aerial video of the departing cell using the Phantom 3 Advanced. One page report with 9 images and 1 video clip. - REPORT. I chased storms during the weekend of May 21st and 22nd which produced an abundance of cells and several thunderstorms however the weakly capped atmosphere developed too much convection early in the day resulting in messy high precipitation storms. 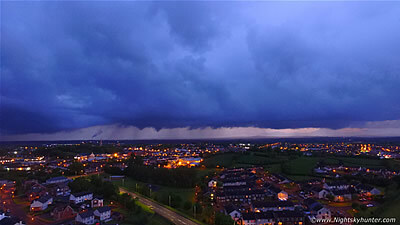 All that changed at dusk on May 21st when a massive storm formed over the S side of Cookstown with huge billowing solid updraughts, I launched my Phantom 3 Advanced drone and obtained aerial video of this impressive storm with lowerings in the eerie blue glow of twilight above the lights of Cookstown followed by a sudden night time lightning show of which I recorded several episodes of stunning pink lightning over Lough Neagh and Antrim which was spectacular to watch above the horizon from the air in the darkness. One page report with 11 images & 1 video clip. - REPORT. On June 6th I did a solo chase to Co. fermanagh then into Ballintra where I intercepted two lively thunderstorms with high sferics rates and rich thunder on the hills in the middle of nowhere with the second storm sporting a nice shelf cloud, I arrived back home after 10 hours on the road only to be hitting the road once again to intercept a plume-type elevated thunderstorm which originated in Wales, crossed the Irish Sea, then impacted E. N. Ireland after dark. I met Conor McDonald ad John Fagan at Ballyronan Marina and three of watched the best night time lightning display since 2005 with three hours of lightning ending in close range bolts over the water which delivered monsoon style rainfall and a freak audio phenomena through the darkness which left us all thrilled. One page report with 17 images and 2 video clips. - REPORT. 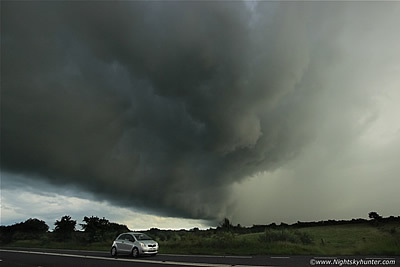 One of two reports covering three days of storm chasing during a dramatic thundery outbreak producing high CAPE and active electrical thunderstorms across N. Ireland for several days in a row. On June 7th 2016 the cap broke during the early afternoon resulting in explosive updraught development across my home area. Conor McDonald and I went chasing locally and made multiple thunderstorm intercepts across Benbradagh mountain, Maghera and Knockloughrim. The storms were slow moving and producing rich lightning strike rates with many rumbles of thunder tapping into over 1000 CAPE of energy on a warm and humid Summer's day. One page report with 11 images and 1 video clip. - REPORT. 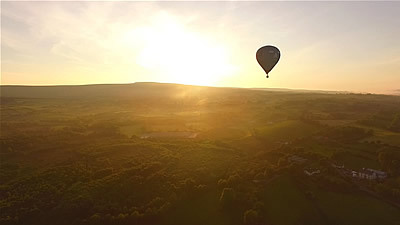 I have always wanted to film hot air balloons with a drone and that chance finally appeared one beautiful warm Summer's evening on June 8th 2016 when in the process of walking through Drumlamph Woodland near Maghera. By chance and with amazing luck a formation of seven hot air balloons rose from a field adjacent to the woods close beside me, I got my Phantom 3 Adv in the air and managed to obtain beautiful footage of the balloons in transit across the western sky at golden hour. The climax happened when one of the balloons eclipsed the sun over a backdrop of the Sperrins and ancient Drumlamph woodland. One page report with 1 image and 1 video clip. - REPORT. The atmosphere looked energetic on June 23rd 2016 with 700 CAPE, LIs of -5 with soundings indicating low cloud bases accompanied by a moist SWly flow with 30 knots of speed shear producing a risk of heavy showers and organised thunderstorms with a chance of hail to 1.5cm and funnel clouds/weak tornadoes. This turned into a very rewarding day involving three chases in my local area beginning with a high precip convective line from Maghera then getting high rewards in the form of the most dramatic storm structure I have captured in years over the Glenshane Road in the form of a huge sheared updraught base complimentd by a dramatic line of storm clouds extending for miles across the sky in the late evening light sporting rare globular cloud structures as multiple sunlit updraughts rapidly expanded in real time aloft. One page report with 18 images and 2 video clips. - REPORT. After years of chasing, hundreds of miles on the road, and countless hours scanning the skies I finally captured my first decent funnel cloud in years during the late morning hours on Friday June 24th 2016 from near home in Maghera. 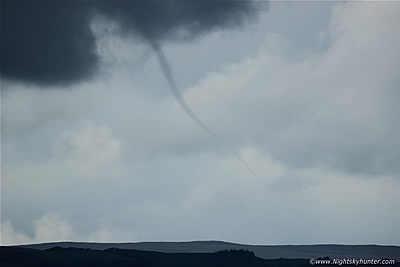 Unstable air with 700+ CAPE with a slack flow and localised convergence zones produced a beautiful well defined rope funnel cloud from the base of a mean cell sitting over the hills outside of town. The funnel rotated in perfect view for 10 min's sporting a lovely curved profile with translucent condensation funnel composed of two vortices embedded inside. 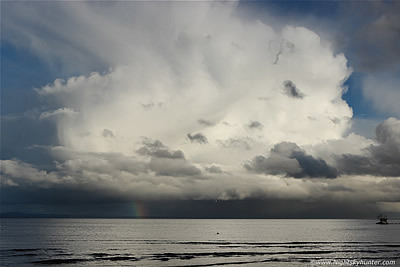 I obtained a selection of images and video clips with the DSLR and 400mm lens as the funnel performed its silent dance in the skies while I watched in complete comfort in warm sunshine in the company of beautiful storm clouds building over the vibrant fields near home which made for a perfect day. One page report with 11 images and 2 video clips. - REPORT. July 19th 2016 was the not only the hottest day of the year with temps peaking at 30 degrees C however it was also the best thunderstorm set-up I have ever seen in this country. An unstable SEly plume of warm and humid air advected N across the country boasting more than 2000 CAPE and a lifted index of -8 with strong wind shear generating the risk of severe thunderstorms, 3cm hail stones, supercells and even an MCS. The cap broke late in the afternoon and eight of us chased to the west coast converging on Mullaghmore in Co. Sligo where we got treated to multiple rounds of elevated storms climaxing in an epic dusk lightning display with pink flashes and in-cloud bolts lighting up a massive sheared storm in three places across 180 degrees of sky. This storm produced the most prolific lightning rates I had ever witnessed with sferic rates akin to flashing lights on a Christmas tree. One page report with 12 images and 1 video clip. - REPORT. 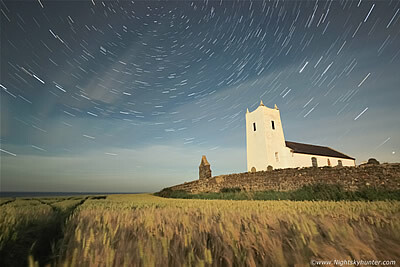 Brand new night shoot on the Co. Antrim coast with John Fagan using the light of the waxing gibbous moon to shoot sky and landscape imagery with star trails over Carrick-a-Reed rope bridge then climaxing with a surreal photo shoot in the middle of the night of Ballintoy church and stars from inside a vast moonlit barely field which made for a fun and atmospheric night under the stars. The report includes drone footage of Ballintoy church and the barely field during the magic light of golden hour. One page report with 9 images and 2 video clips. - REPORT. The 2016 storm season ended in spectacular fashion on Aug 25th when John Fagan and I chased a huge organized multicell thunderstorm in a highly sheared set up which allowed for explosive thunderstorm development after a late afternoon cap break. We intercepted the storm at Downhill Beach where we had the luxury of watching the storm build from the west while crawling towards us forming a spectacular stacked shelf cloud with pink lightning flashing away. 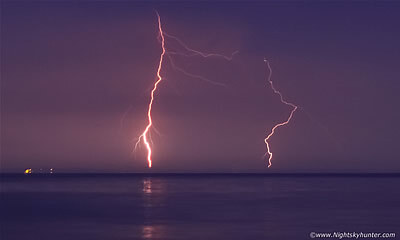 This storm became our fourth night time thunderstorm of the season with a bombardment of c-g and in-cloud bolts lighting up the sky over the sea from the beach. 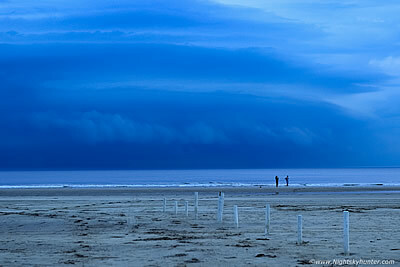 This storm would become famous for sporting the best shelf cloud ever seen from N. Ireland. One page report with 15 images and 1 video clip. - REPORT. On Sept 25th I was heading to the coast for a day of drone filming when I suddenly saw a massive fire in the distance. I changed my plans and made my way in the direction of the smoke and discovered a violent fire in progress at Higgin's Car Dismantlers on the hills outside Garvagh. 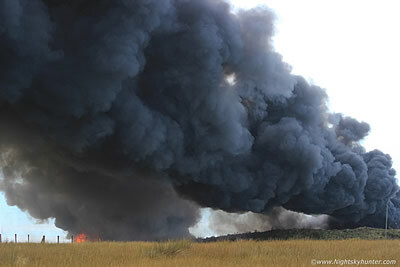 This fire raged in the afternoon heat with vast billowing smoke plumes blowing for miles down range at spectacular speed while the fire engulfed cars accompanied by loud popping and cracking sounds from tires, oil, and petrol erupting in the blaze. In total 600 cars were destroyed, the following report is a combination of ground based DSLR stills and drone aerial video. The fire was eventually brought under control thanks to numerous fire fighters and police at the scene. One page report with 8 images and 1 video clip. - REPORT. Convective Adventures - 2016 video presentation featuring footage of storms, weather and night sky phenomena captured from Ireland/N. Ireland throughout the year using my Canon 600D DSLR, Go Pro Hero 4 Silver and Phantom 3 Advanced drone. This presentation is almost 27 min's in duration and edited with a relaxed slow pace in mind as the video takes you through many of my adventures, photo shoots and storm chases which made for a fantastic year, in fact, this was the best year for storms I have witnessed since 2009 with 2016 surpassing even that active season which included an abundance of day time thunderstorms and four night time lightning events. These events are complimented by footage of sunsets, funnel clouds, aerial rainbows, snow aerials, snow devils (a first for me) and even extremely rare PSCs or Polar Stratospheric Clouds better known as Nacreous or Mother Of Pearl. If you keep watch on the lower left corner you can read the location where any particular clip was filmed. Make yourself comfortable, turn down the lights, grab a brew and watch at 1080P full screen. I hope you like it, thanks very much for watching.